REVIEWS: Chub Rub – Original – I Love It Spicy! Chub Rub was conceived in early 2010. After spending countless years grilling with off the shelf dry rubs, two grilling aficionados decided one night, that they would create their own version of a perfect blend of spices to produce the taste that they had been looking for. After many months of researching how different spices react with each other, and with their taste buds, Nick and Danny narrowed their spice selections to one prestigious list. 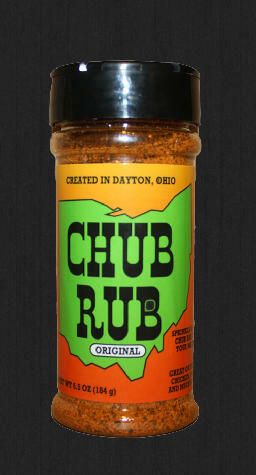 After acquiring these certain spices and blending them together, Chub Rub was born. Over the next year and a half; they cooked out many times weekly, sometimes trudging through the snow to get to the grill, ensuring to take notes and tweak the recipe each time. Nick and Danny even brought on a new partner named Zach to help perfect the recipe. After over a year and a half, the rub was finally deemed perfect! Once Nick, Danny, and Zach were happy with the blend, they began to pass out the rub to all of their family and friends as gifts for various occasions. After receiving rave reviews from every person who tried Chub Rub, they knew that they had a truly special creation. After much convincing from people who had tried the rub, they decided to bottle their product to share the special blend with the world. It is our sincere pleasure to offer our pride and joy to every one of you. We are devoted to quality and have ensured our recipe is unique and will offer a truly enjoyable experience. Due to the overwhelming demand and rave reviews to our initial rub, we have begun the process of exploring different blends and sauces. Please check back often, as new products will be coming! We want to sincerely thank each of our customers! Without you, we would not be able spread happiness with our special blend to all of America. Thank you, God bless, and remember to always “Sprinkle Some Chub Rub on Your Meat”! The Reviewers for this one are Fiber Joe, Xero, and back by popular demand The Gregger.